Ehud Barak calls on High Court to torpedo Nationality Law. Shaked calls Barak a 'coward' in response. 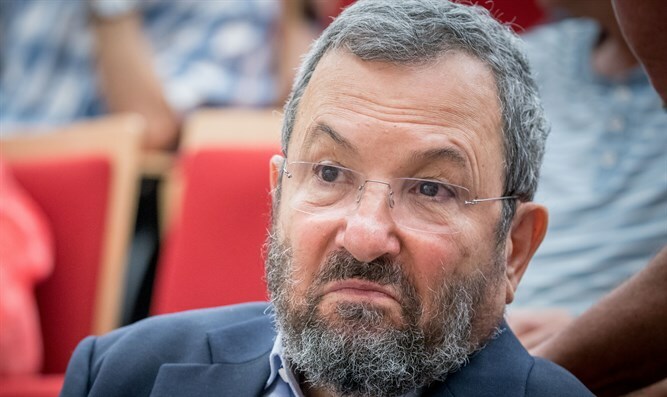 Former Prime Minister Ehud Barak said that the High Court of Justice needs to torpedo the Nationality Law, saying that "it was time to go to war" over the legislation defining Israel as a Jewish State. Responding to Justice Minister Ayelet Shaked's remarks on Sunday that the High Court of Justice would cause "a war between the branches of government" if it scuttled the Nationality Law, Barak said that "we should go to war with our head high and demand that the Declaration of independence be legislated as a Basic Law". Writing on Facebook, Barak said that Supreme Court justices needed to disqualify the Nationality Law, "because despite being enveloped in a laundered language, its goals are to undermine the ability of the Supreme Court to act in the spirit of the Declaration of Independence and to prepare the ground for subsequent legislation of racial laws, apartheid, and transfer." "You have to be stupid or stupid in order not to see it through the eye-catching covers, which are the real area of expertise of Netanyahu and his minions," said Barak, who added that the legislation "serves the toughest enemies of Israel, the anti-Semites, the BDS, who demands that senior government and IDF officials be brought to the Hague." Shaked responded by calling Barak a "coward" for what she said was his refusal to respect the legislative process. "We need to give Ehud Barak a lesson in democracy. This is the post of someone who is a coward," Shaked said during an interview with 103FM on Monday. "If he wants to change the law that will win a majority in the Knesset. Because he knows he cannot get it he runs to the Supreme Court," continued the justice minister. "If he wants to influence what is happening in the country and the legislation that will try to win a majority in the Knesset and not run to the door of the court." "It's cowardly, if you want to change, you have to deal and get a majority in the Knesset for legislation." The Nationality Law codifies Israel’s status as the nation-state of the Jewish people into Israel’s Basic Laws and establishes Hebrew as its sole official language while giving Arabic special standing. The law has aroused opposition among Israel's Druze community and the Left, who contends that it discriminates against minorities. The Druze and Bedouin communities have appealed to the High Court of Justice in an attempt to scuttle the law, leading Shaked to embark on a campaign warning the Supreme Court that it is not authorized to strike down semi-constitutional Basic Laws. "Such a move would cause an earthquake between different branches of government,” Shaked told Army Radio on Sunday. "The Knesset is the assembly, which defines and determines the Basic Laws. Judges have to interpret the laws in accordance with the basic laws, and I don’t believe a majority on the Supreme Court would take such a step."